Jersey Girl is a tiny, red female that weighed in at 54lbs. Her birthday is Aug 20, 2009. 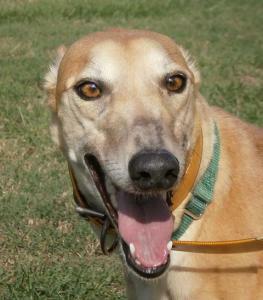 She is very cute, outgoing and friendly with a tail that never quits wagging. She actually whacks herself in the ribs with her tail sometimes when she gets really happy. She passed her cat and small dog tests so should be able to live with either, She loves people and is already home acclimated. She is sweet and loving, corrects well and wants to please. She is has a lot of personality and is a fun girl. With that cute face and great personalilty we think she is awfully close to perfect.